Posted October 24, 2018 by Will Best & filed under Uncategorized. Computer systems are able to store and process vast amounts of information, make calculations, transmit complex messages across great distances, and create records. It’s fair to say that, during recent decades, computers have revolutionised the business world. But one thing computers still can’t do is think for themselves. A computer can’t look at an object and recognize it without some frame of reference. And it can’t tell the difference between two such objects unless we help it to do so. That’s where barcode labels come in. Barcode labels are one way a machine can be made to recognize an object for itself. They are that all important transitional step between the physical world and the world of data that is the computer’s memory. To see the impact which barcode labels, stickers and tags have had on the retail sector, we need only pay a visit to a local supermarket. Many years ago, a shopkeeper had to calculate a customer’s bill mentally, or by using a pen and paper. When the cash register came along, these calculations could be performed by punching the prices into a numeric keypad. But the process was still very much dependent upon a human operator. The next leap forward in technology was the introduction of product barcodes. By attaching barcode stickers to all their products, stores made these items instantly recognizable to the computer system. Bills could be calculated, stock levels adjusted and sales recorded simply by passing each product through a barcode scanner. The technology has become so successful that some retailers are eliminating the need for checkout staff altogether in favour of self-service barcode scanning machines. But what information is actually stored on a barcode label? Those who are unfamiliar with the technical side of EPOS systems are often surprised to find out that a barcode is simply a number – nothing more. But it is a number in a form that a computer can recognize, and once the barcode is scanned, the computer can link it to all the relevant information such as price, product type, and so on. Thus, barcodes can be used for far more than just adding up shopping bills. By using custom barcode labels, any item or location can be made identifiable to a computer. This approach has long been utilised in warehousing systems. Locations in a shelving or racking system are fitted with barcode tags, and every time stock is added to or removed from the location, the barcode is scanned and the details of the movement are recorded. If this procedure is followed diligently, the computer system will always have an accurate record of the locations and quantities of all stock in the system. Many companies now use asset barcode labels to identify each appliance and piece of equipment on their premises. This makes it easier to maintain and test such items, and to monitor their movements. 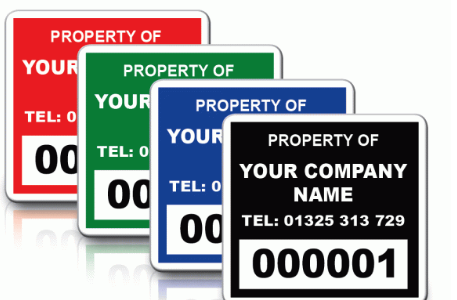 If you are searching for custom barcode labels online, visit PAT Labels Online and see what we can do for you.